Fei Long Zai Tian is a 5 reel and 3 payline slot game produced by Playtech. The game has a Chinese theme that takes us back to Ancient China where dragons roamed and ruled. Apart from dragons, the game also features a multitude of Chinese symbols of good fortune. Many of them should be recognizable even to the Western eye and include Lucky Bamboo, Koi Fish, Lucky Frogs and Good Luck Charms. The reels are ornately decorated and seem to take place on a golden scroll. The background contains a misty sky above a blue lily pond. 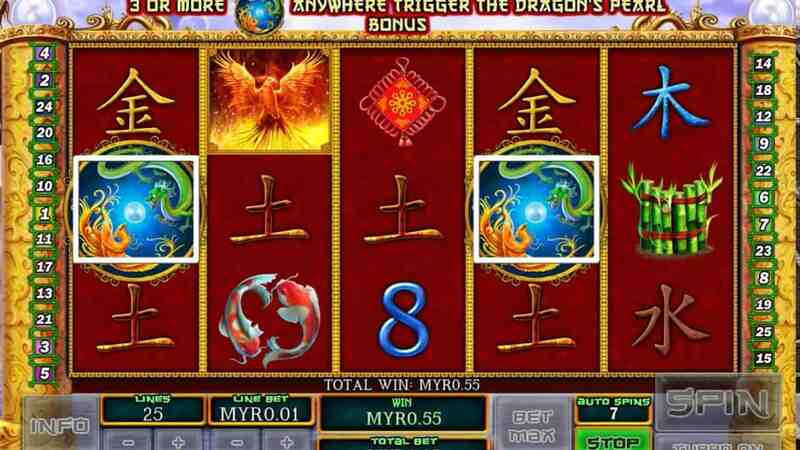 The Free Spins Round is activated by landing 3 or more Dragon & Phoenix Scatter symbols anywhere on the reels. Players will automatically be awarded 8 free spins as well as a 2x multiplier. Before the round starts, players will be asked to choose 2 of 5 mystical pearls to reveal further free spins and multipliers. Free spins can be re-activated indefinitely if more Scatters are landed in the Free Spins round. The low value symbols of the four Chinese characters have the lowest pay-out, paying players 100x their bet for 5 of a kind. The Lucky 8 and the Brown Chinese Character each reward players with 150x their bet for the same combo. The Lucky Charm and the Lucky Bamboo both pay out a maximum of 250x the players bet while the Koi Fish pay out 400x. The Phoenix and Money Frog symbols are the highest paying standard symbol and can pay up to 750x your bet for 5 in a row. The Wild Symbol in this game is the icon of the Green Dragon. This symbol has the power to replace all other standard symbols except for the Dragon & Phoenix Scatter symbol. The Green Dragon is stacked on all the reels thus creating many more winning opportunities. It is also the game's most valuable symbol and pays out an impressive maximum of 10,000x your bet if 5 lands on an active pay line. Betting options at Fei Long Zai Tian are varied and novices and high rollers alike should enjoy this game. There is an 'AutoPlay' feature that allows players to automatically spin the reels on their desired bet for a predetermined number of spins. This speeds the game up and makes for exciting game play. Fei Long Zai Tian is also available on mobile and is compatible with Android and iOS devices, making it perfect for the player on the go. Orange Chinese Character, Green Chinese Character, Red Chinese Character, Yellow Chinese Character, Blue Chinese Character, Lucky 8, Lucky Bamboo, Koi Fish, Money Frog, Chinese Charm, Phoenix. The Wild is the symbol is the Green Dragon and can substitute for any of the game's symbols except the Scatter. The Scatter symbol is Phoenix & Dragon symbol and activates free spins as well as multipliers. Fei Long Zai Tian is a well-rounded online video slot game from Playtech that performs well in all aspects. Although it may not be as feature rich as other Playtech games, the features on offer of a high quality and are exciting and rewarding enough. The graphics are eye-catching and all stay in line with the Ancient Oriental theme.